Informed sources in Cairo say that recent French actions on Libya in coordination with Turkey and Qatar are raising resentment, as they ignore many developments on the ground and serve some parties without taking into consideration balance on the Libyan scene, which is reminiscent of former French President Nicolas Sarkozy’s decision to overthrow Libyan president Muammar Gaddafi in 2011. The sources said that France’s actions in Libya serve its direct interests, believing that it could secure gains in light of the obvious differences among regional and international powers on the issue. The sources added that Paris is trying to benefit from the presence of the United Nations envoy Ghassan Salama, who is working on implementing the French agenda and is becoming part of the crisis instead of being part of the solution in Libya. France will hold an international meeting on 29 May, which will be attended by the chairman of the Presidential Council of Libya and prime minister of the Government of National Accord Fayez Al-Sarrag, the head of the Libyan National Army Khalifa Haftar, the president of the Libyan House of Representatives Aqila Saleh and the new president of the High Council of State Khaled Al-Mishri, as well as representatives from Al-Zentan and Misrata and a number of militia commanders. Sources say that the meeting in this form injects new political blood in the veins of the Islamist powers in Libya, and goes in line with the aspirations of their leaders to be key players on the Libyan scene. The sources added that the Muslim Brotherhood in Libya are seeking to take advantage of the recent French moves, to conceal their decline in popularity and their diminishing influence in light of the expected return of many elements related to the Gaddafi regime. Sources also say that France played a significant role in the Dakar meeting held two weeks ago, which involved a number of Libyan Islamist leaders including preacher Ali Mohamed Al-Salaby and the former leader of the Libyan Islamist Fighting Group Abdel-Hakim Belhag. Libya figurers in Cairo accuse Paris of moving to build bridges between Islamist and non-Islamist powers, as it blessed the meeting held last month between Khaled Al-Mishri and Aqila Saleh in Morocco, in an attempt to fragment non-Islamist parties, which are expected to win a large percentage of votes in any future elections. Paris is moving to enhance its presence in Libya to secure its interests in Mali, Niger, the Central African Republic and Chad, all states where Paris maintains a significant military presence, sources say. France also seeks to increase its influence in southern Libya to control the country's most important oilfields and reduce Italy's growing economic influence, while attempting to avoid a clash with the United States. The sources in Cairo did not rule out the possibility of Paris repeating its mistakes in 2011 – when it played a pivotal role in overthrowing Gaddafi, leaving Libya in the chaos of armed conflict – if it insists on continuing its coordination with Ankara and Doha and Islamist militias without considering other views. The sources say that the UN envoy’s moves in Libya serve the French plan, highlighting that his plans to achieve a political solution to the crisis have not yielded any significant results despite being approved by the UN Security Council last September and include amending the Skhirat agreement, drafting a constitution and holding elections. The UN envoy announced the possibility of holding the elections soon, an announcement that was supported by some world powers including France. An Egyptian source who attended the recent meeting on Libya in Algeria last Monday – which was attended by Tunisian, Algerian and Egyptian officials – says that the three countries agree that the UN envoy's plan in Libya has failed, stressing the necessity of providing all means of logistical assistance and security to guarantee its success, and warning against holding elections in the absence of these factors. The Egyptian source affirmed that Libya's neighboring countries are deeply concerned by the deteriorating security in Sabha and most of Libya's southern regions, which have become a base for extremists and members of Daesh and Al-Qaeda. 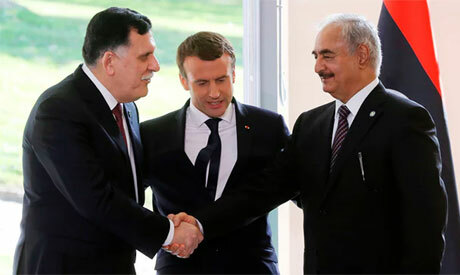 He also affirmed that the French decisions on Libya lie in the hands of French intelligence, which is controlled by strong elements connected to former president Nicolas Sarkozy. The source warns Paris against following in the path of the political aspirations of President Francois Macron. The source said that the failure to consider the facts in their true form and bowing to the idea of coordinating with Turkey and Qatar, the most important patrons of the Islamists in Libya, have played a role in shaping the French moves on Libya.